What’s does it take to reach 4700 people with a safety message they are actually open to hearing? A lot of presentations…60 in the past year, to be precise. I say “We” but it’s not ME out there delivering workplaces safety presentations anymore. Rather, it’s an amazing crew of dedicated individuals who care deeply that emergency responders make it home safely after every shift. Jody Laird, the JPMF’s main presenter, is a 911 dispatcher for the City of Calgary and is passionate about public speaking. 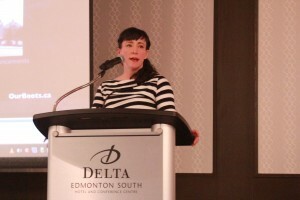 Since graduating in 2000 with a degree in social work, Jody has presented keynote speeches, presentations and seminars across Alberta on a wide variety of topics. Jody lives in Airdrie with her two children and her husband, a Calgary police officer and JPMF Board Member. Growing up as the daughter of a Calgary police officer, Lindsey Jepson had a strong appreciation of emergency responder work from a very early age. 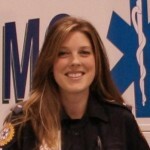 After having three children, she began her career with Calgary Metro EMS. Recalling very clearly the day that Calgary lost one of “our finest” in such a senseless way had a large impact on Lindsey. The opportunity to help further John’s legacy by sharing workplace safety messages is a true privilege. Please click here for further information on the JPMF’s Safety Presentation Program. If you would like to book a JPMF speaker to deliver a personalized safety presentation to your Alberta company, organization, school, etc, please contact the Safety Presentation Program Coordinator, Sarah Hourihan, at sarah@jpmf.ca. To make a donation to the JPMF, a registered charity, here is the link. Thank you for helping us spread the word that EVERYONE has the right to make it home safely from work! Maryanne Pope is the Board Chair of the John Petropoulos Memorial Fund. She is the author of A Widow’s Awakening and the CEO of Pink Gazelle Productions Inc. Thank you JPMF and to the speakers for all your work to make injury prevention and safety in the workplace top of mind for Albertans! The message that every place is the workplace of emergency responders is starting to get through, thanks to the important safety presentations you, Jody, and Lindsey are sharing with the public. It is my fervent hope that preventable workplace injuries and fatalities become a non-issue for emergency services personnel as a result of the public ensuring their workplaces are safe for everyone, all the time. Sounds like the JPMF’s Safety Program is proving to be an excellent way to promote their program on injury prevention and safety for all! Keep up the awesome work!! As a police officer, I truly appreciate the effort the JPMF Safety Program has put into raising the awareness of workplace safety. All businesses need to create an environment that is safe, even when regular staff aren’t there. Awareness is the first step, education and change come next. Keep up the good work.